Resource Editor: How To Edit A Menu Item that Define The Appearance and Function of an Application Menu. A menu resource is a collection of items that define the appearance and function of an application menu. A menu is a specialized input control that lets the user select commands and submenus from a list of menu items. 1. Expand the 'Menu' folder and select the target menu resource from the Resource Tree View. You will see a preview of what the menu looks like, with submenus, menu and popup items. To see the script behind the menu that makes it work, select the Script View tab. 2. 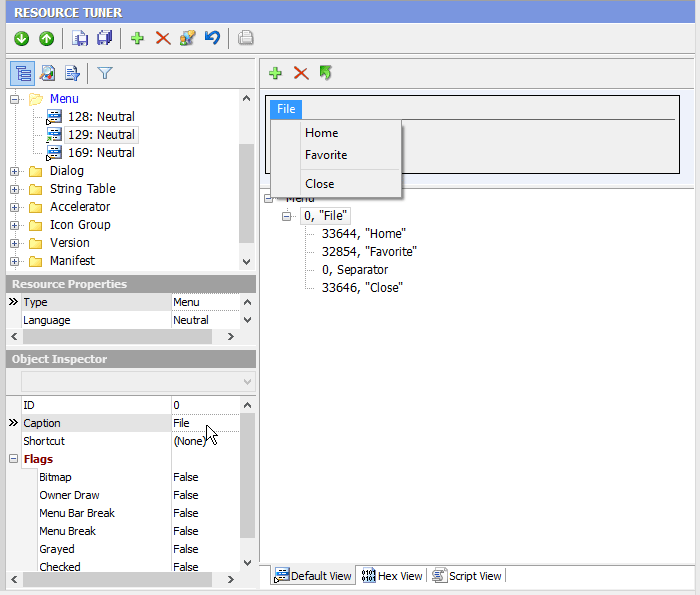 The Object Inspector allows for changing the item IDs, shortcuts, captions and flags. 3. Select 'File' -> 'Save File' to save the changes you have made to the target file. Any change you make can be restored prior to quitting Resource Tuner. Menu IDs cannot be edited. These values are hard coded into the target file. Changing them is likely to cause the modified program to crash.